Miami HEAT and San Antonio Spurs collided in the 2nd Game of the NBA Finals from Miami. In a game of two halves, Miami prevailed and made a big statement with a resounding 19 point win. Game 1 saw San Antonio Spurs take a lead in the series, defeating Miami 92 - 88 with a stellar performance by Tony Paker and 'The Big Fundamental' Tim Duncan. Meanwhile, LeBron James' 18pts, 10 assists and 18 rebounds were not enough for the previous Champions to get the win. The first quarter ended all even 22 - 22, the leading scorer being Danny Green after scoring three consecutive three-pointers. Halfway through the first quarter, Danny Green has outscored LeBron James 9-0. Another interesting fact is that the Spurs had 5 turnovers - more turnovers in the first quarter than their total amount in Game 1. It was an entertaining way to kick off the game, with both teams looking good and wanting a victory in the NBA Finals. Miami HEAT finished the first half five points ahead and with the intense defense they had forced 8 turnovers for the Spurs. Danny Green finished the half as top scorer following four three pointers, and LeBron James had only four points - a shocker to many. The bulk point-scoring was from Miami's backcourt with Wade and Chalmers both scoring 10 points. The HEAT dominated with the points in the paint, and also got a hand from the bench scorers. Spurs however trailed in points in the paint, but were 6-6 from beyond the arc. The third quarter saw Miami take the biggest lead of the NBA Finals, collating a run of big plays. Mario Chalmers took many of the headlines in the quarter, with several important plays including him giving up an open three to assist Ray Allen. HEAT finished the third quarter on some serious momentum, with the first double-digit lead in the finals, and Miami looking to settle it in the fourth quarter. LeBron James was effective not necessarily on the stats, but on aiding his team in the screens. Chalmers and Wade continued to keep the HEAT going, whilst Danny Green proved he was a talent but his team trailed. After a solid start, Spurs looking all kinds of out-of-sync now. 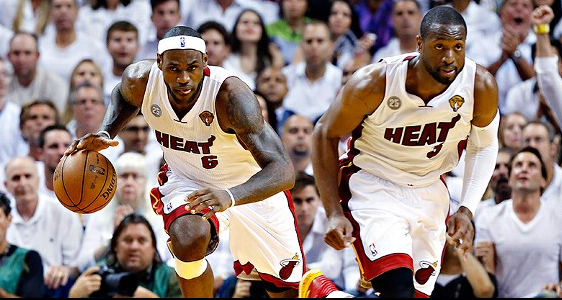 If the Heat want to take control of this game, now's the time. The HEAT were quick off the mark in the fourth quarter, continuing their dominance in the third quarter and were on a 23 - 3 run, leading 84 - 65 when the Spurs called a timeout. This was the major turning point in the game, the HEAT had taken over and were in control. It was officially a blowout - LeBron was on fire now, and HEAT had it in the bag. LeBron was involved in one huge moment in the game, with a MONSTER block on Thiago Splitter! The HEAT bounce back from their Game 1 loss to dominate the Spurs. A game of two halves, one of which was close, the second of which Miami ran away with it and made a big statement. One thing does remain, the Spurs have stolen homecourt advantage, will this be a factor? Miami pull through off a big run, now for Game 3, from San Antonio. Miami Heat trump the Spurs in Game 2 of the 2013 NBA Finals.